Who says delicious pasta has to be fattening? If you think that mouthwatering lasagna or creamy fettuccini alfredo is strictly off-limits for your diet, think again! At Diet Direct, we have a wide selection of low calorie chicken pasta, high-protein spaghettini and other healthy pasta meals. Do you have a craving for beef stroganoff with noodles or vegetable lasagna? No problem! Brands like BariWise™ and WonderSlim® offer appetizing, protein-rich and low-fat pasta meals such as cheese steak macaroni, macaroni and cheese and more. Choose from beef, chicken, cheese or tomato flavored, and we have great healthy pasta dish recipes for vegetarians. Enjoy Eating While You Diet! Diet Direct believes that you should be able to enjoy the foods you love while still being faithful to your diet and achieving your weight loss goals. It is our mission to provide the highest quality, nutritional diet food, so that you can stay healthy and enjoy your meals while you’re shedding pounds. 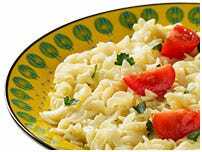 BariWise pasta dishes give you the heavenly Italian flavors you crave, while providing you with plenty of protein, fiber, low calories and good nutrition. Their meals require no refrigeration and are packaged in a microwaveable tray. WonderSlim is another great diet food company that offers tasty pasta dishes, from spicy cheese and pasta to creamy, luxurious fettuccini alfredo. Low calorie and high-protein, these authentic Italian meals provide multiple servings per box. With these delectable dishes inspired by the Italian tradition of satisfying “comfort food,” you’ll realize your weight goals without having to turn away from your love of pasta. Yes, it’s possible! We have years of expertise in the nutritional diet food industry. Give us a call if you have any questions about our products or need help in putting together the right meal plan for your unique requirements. We’re committed to our customers’ satisfaction, so much so that we are proud to offer a Money Back Guarantee on all purchases.